For over 70 years, Clowns International - the oldest established clowning organization - has been painting the faces of its members on eggs. 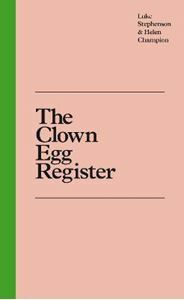 Each one is a record of a clown's unique identity, preserving the unwritten rule that no clown should copy another's look. At first they were painted on real eggshells, then later (when they kept breaking) on to ceramic eggs, most of which are now housed at the Wookey Hole Clowns' Museum. Here images from this extraordinary archive are accompanied by the stories of the men and women behind the make-up.